Deep stock market drops can certainly be nerve-wracking, but what’s interesting here is that depending on whom you ask, you’ll always get different reactions when something like this happens. Volatility affects people in different ways such that their profile, life circumstances and investment set up will dictate how deeply these market movements affect them. Who’s most likely to get upset by a stock market fall? Those who fall for media hype and sensationalistic news about the markets. Those whose investment and risk profile are not in line with how they’re invested. Those who are new at investing and who aren’t used to seeing the markets tank. Unfortunately, most people learn the hard way about putting their money on the line — which is all good, since that’s also how I learned. When I was younger, I believed that I could afford to take some risk and therefore would be able to withstand some trades, shorts and other aggressive (or foolish?) moves for a period of time and still be able to bounce back. So I dabbled in the market without much of a plan. It didn’t help that my experimentation coincided with the commencement of the Iraq-Kuwait war. So I lost a bunch of money but learned a ton. While doing these plays, I also began my personal finance education through periodicals like Money magazine, Kiplinger’s and Barron’s. It took a while for me to discover an investment style I was happy with and that would allow me to properly calibrate my own investment performance expectations. I got more experience and education before I found a style that coincided with my comfort level. It turns out that from all the possible ways of “playing” the market, I was most attracted to the passive, indexing approach that involves a highly diversified asset allocation plan. Contrast this to many of my friends who love to try to “beat the market” and to trade individual stocks inconsistenly. It’s clear that the style I’ve embraced lends itself to a more relaxed way of looking at the market. I’ve basically accepted that the market will do what it will do, so I’m not going to fight it or obsess over trying to beat it. My performance expectations, market strategy, comfort level, risk profile and even personality all work together to tell me that market corrections shouldn’t bother me. There are also several strategies I’ve employed to feel better about a wild market. 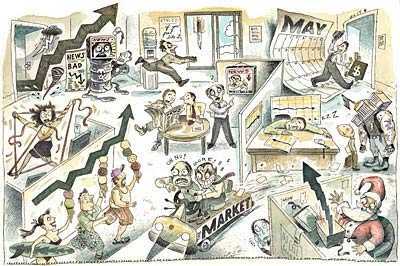 I first wrote about it in this article, 5 Ways To Survive a Volatile Market. It hasn’t been a few months and we’re seeing “ugliness” all over again. So what else can we do to feel better about slumps like these? #1 Think like a contrarian. If you think about the “buy low / sell high” mantra, you’ll see that this scheme really encourages you to take on a contrarian approach. Going against the herd will encourage you to get excited when stock prices dive and to feel cautious when they rise. Unfortunately though, not everybody will find this strategy easy to embrace because we’re heavily influenced by those around us. The herd mentality is ingrained in human nature. If you’re like me though, and you have just a bit of a rebellious streak with a dash of general pessimism in your disposition, then going against the psychological current may not be as taxing to do. #2 Act like a contrarian. Stem your market anxiety by dollar cost averaging into the slide or a perceived bottom. You’ll force yourself to buy more shares at lower prices now. Rebalance your portfolio. Here’s a chance to move some funds from stronger to weaker asset classes. Have an emergency fund? Move it into the market. Then build your emergency fund back up to what it was. I’m typically what you call a passive or “sleeping” investor. I don’t like tinkering with my portfolio much and I crave financial simplicity. But when the market tanks, I wake up and get a little more active. Must be that contrarian bent in me! #3 Be well hedged or have a well diversified portfolio. By practicing solid diversification strategies and picking an asset allocation you’re going to be happy with, then in the end, no matter how badly the market swings, you should be able to sit tight. You know you’re diversified if market tumbles don’t rattle you, knowing that diversification works to cushion your portfolio from volatility and losses. So *even* if one asset class craters (such as your international funds or your more aggressive holdings), your overall losses are mitigated. It’s easy to focus and obsess on the areas of your portfolio that suffer the largest declines, but in reality, these may only cause a minor dent to your financial big picture if you are properly diversified. #4 Take the media hype with a grain of salt. Bad news events come and go. There was a time when the Chinese stock market caused jitters and waves throughout the global arena. There was also a time when subprime credit issues sparked a serious financial crisis. 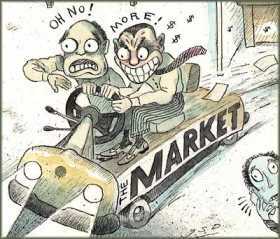 The subprime mess and financial crisis seemed to cause some level of hysteria, thanks to dramatic coverage by the media. Lately, debt concerns are in the limelight, threatening to bring down many international markets. Sure, there’s a lot of hurt out there, but we see a lot of this type of news recycled every few years. The Standard & Poor’s 500 and Dow Jones industrial average ended trading Friday at the week’s lowest levels, mark the worst one-week percentage drop for the S&P 500 in nearly five years and the gloomiest on the Dow in five months. Be wary of added drama and fear-mongering in journalistic efforts such as these. The Dow Jones industrial average finished the week down 4.2 percent, the Standard & Poor’s 500 Index dropped 4.9 percent and the Nasdaq Composite Index declined 4.7 percent. Year-to-date, the Dow is up 6.4 percent, while the S&P 500 is up 2.9 percent and the Nasdaq is up 6.1 percent. Aha! Wouldn’t you know it — that last line was slipped in to give us a more balanced perspective. Be alert to this kind of reporting. The point here is that stories like these tend to be rather myopic. A different perspective may show that the U.S. stock market is up between 3% to 6% for the year, even while it has suffered dreadfully during a particular month. So who knows? There may just be enough time for the bull to make up for lost ground before the year closes. But even if it doesn’t, why not take a step back and check historical returns for an even bigger picture? Has it really been that bad? #5 Anticipate possible buying opportunities. So is it a better time to jump into the market after it suffers a several hundred point haircut? When we become inundated with this kind of news, determine whether this situation presents a valid opportunity or if you’ll need to wait a while longer. For the week, the Dow fell more than 585 points, or 4.23 percent. The percentage decline was the largest since late March 2003. The Dow’s retrenchment leaves it 756 points below its high from last week. That 5.4 percent decline puts it more than halfway toward the technical threshold of a correction, which is 10 percent. In this example, this drop is halfway to a technical correction, and should be sweet news to market vultures out there. However, I’d still be cautious about exactly when to jump in. When corrections occur, they usually take some time to work themselves out and further dips can be in the cards. Don’t be fooled into catching a falling knife but don’t feel bad about missing the “low” either. There’s no perfect science in buying dips. #6 Realize that market pullbacks are healthy for the long term. Unless we’re at the beginning of a massive bear trend, stock market corrections are health-restoring. Is everyone yelling “the sky is falling”? Or are experts more cautiously optimistic? Find out if the tumble in stocks is deemed a “necessary sell-off” that could very well deflate a growing bubble in a hot market. If so, then the pullback should be a good thing. #7 Still feeling edgy? Here are more tips! Take stock of some additional advice to help you soothe your nerves. Hopefully these pointers provide you some assurance during these roller coaster rides. Created July 30, 2007. Updated September 5, 2011. Copyright © 2011 The Digerati Life. All Rights Reserved. Great post! I have been thinking about bargin hunting over the weekend. I plan to use some extra cash to purchase some stocks and mutual funds. I will also exchange some of my retirement funds from bonds to stocks. I just wrote a post about this subject. I also went straight to my brokerage on Friday after the market kept sliding so I could take advantage of it today. There are a lot of great deals out there. I’m 22 yrs old and started my Roth IRA this year. I’ve been hit hard on the small amount of funds I have in there. I realized two things: I’m not diversified enough since I hold mostly international stocks and some taxable bonds. I have added more domestic stocks through an index and I am rebalancing my assets to have more of a 60%(domestic)/30%(int)/10%(bonds) portfolio. I am using T. Rowe Price. Lesson learned. I do think it is time to start investing if you have not already. Stocks are down and shares are on sale! I would suggest buying mutual funds also or adding to your 401k, it is a perfect time for that. I don’t get bothered by price drops because I view price drops as a good thing. It’s always a good thing to be able to buy something at a lower price. It’s excessive price increases that bother me. When you pay too much for stocks, it takes a long time to earn a decent return. Great points Rob. How do you determine (for yourself) if you’re comfortable enough to buy into a stock? I remember one of your guest posts mentioning how you avoided the stock market for an extended period of time (in recent years) and stayed in cash due to stock valuation issues. I found that remarkable. “Remarkable” is one of the nicest words anyone has ever used to describe my investing ideas, SVB. I don’t buy any individual stocks. I understand that lots of smart people do. I just think it takes research time to make it work and I would rather direct my free time to other pursuits. So it’s not for me. I believe that indexing is the future of investing for the middle-class investor. Unfortunately, I think that the indexers made a terrible mistake in coming to believe that indexers don’t need to look at prices. I am too frugal by nature to buy anything without looking at the price first. I’m just not capable of going down that road. So I am waiting (and waiting and waiting) for indexes to be available again at reasonable prices. Going by the historical numbers, stocks have not been available at reasonable prices for 15 years now. Yes, it sounds strange that I have been out of stocks for that long. But it is really just an historical anomaly that I did not have money to invest until stocks went to dangerous price levels and this just happened to be the longest time period in history in which stocks have stayed at such price levels. Lots of smart people think I am crazy. I don’t. But then the true crazies always think they are on the right track, don’t they? Hence, I find your take on things fascinating — as you are someone who actually made the 100% commitment to the unpopular position, and well, depending on when and how you did it, you could very well have slayed us all on returns! 🙂 At any rate, the picture of returns over the long term is always changing, depending on which decade long period you are investigating. These days, the long term average is not as good as it used to be (due to 00’s numbers).